AFTER WEEKS OF WORK, OUR NEW AND IMPROVED KITCHEN IS BACK IN SERVICE! Newton Falls native Richard Boston always entertains as a vocal/guitar soloist, playing a variety of music from a huge repertoire. He takes requests! Our annual St. Patrick’s Day party is always a festive event! As always we’re offering some fantastic Irish music from 6:30 to 11:00 pm. First up is the quartet Mixed Greens…instrumental masters of Irish music and a very unique local act featuring world-class musicians. 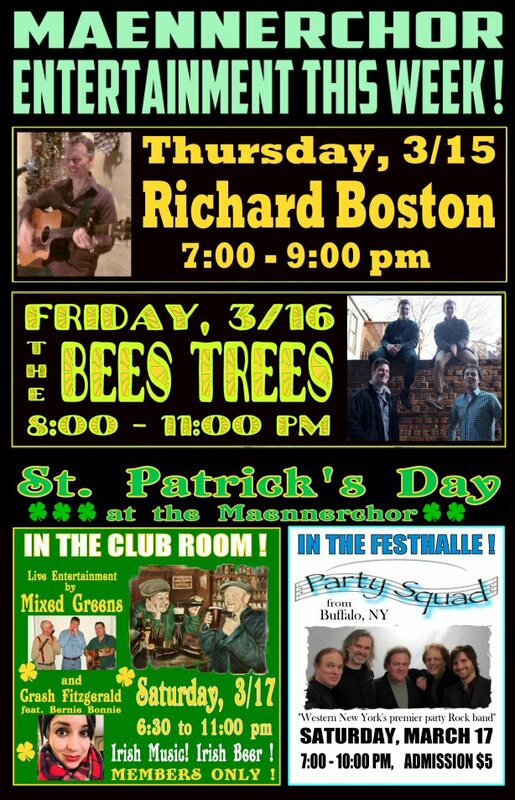 Following them will be Youngstown’s piano queen Crash Fitzgerald doing a unique show of Irish tunes accompanied by Bernie Bonnie on strings! As always, we’ll be tapping a few kegs of Irish beers. On tap will be Guinness Stout, Harp Lager, and Smithwyck’s Ale. There will be Irish-themed food specials as well as our regular menu! So, wear your green and join us to celebrate St. Patty’s! Also, in the Festhalle, from Buffalo NY we welcome the Party Squad! Self described as superlative musicianship, no silly costumes, no fake music tracks, just a great array of great favorite, classic, vintage, and new music performed by expert musicians who have become and remain one of Buffalo and Western New York’s favorite, highly recognized, and well respected music groups. The Festhalle show has an admission of $5.